Bike Parking Displaces Car Parking?! Ride on! After meeting a client for coffee this morning, I decided to mosey up King Street to see what was going on at the capitol. (Any 50,000+ protester rallies today? No? Dang. Oh well - Recall!) At the top of the street I spotted something I have never seen here before. No, not a psychedelic bicyclist zooming down the street. The first parking spot had been bounded by posts and bumpers, and two bike racks were positioned within. A CAR parking space re-purposed for bikes. The meter was bagged, implying free parking. Wha..? 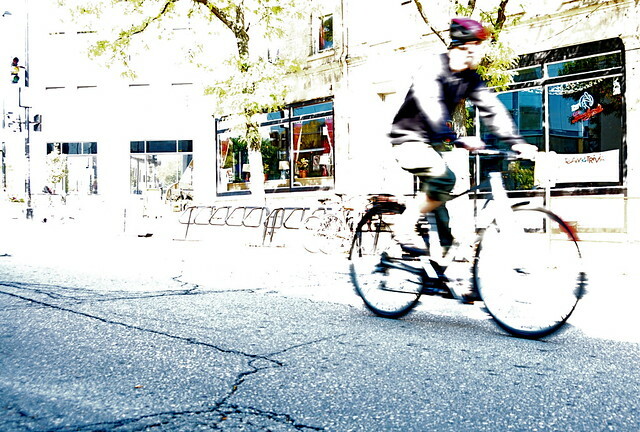 The intent is clear: Make it desirable to bike downtown rather than driving your car. At the moment I spotted the rack, there were only two bikes in it, and one had a flat. The shopkeeper I spoke to outside of Tipsy Cow seemed thrilled because she likes to bike to work. +1, I guess. The bicycle corral provides space for the parking of 10 bicycles in what had been one car parking space. 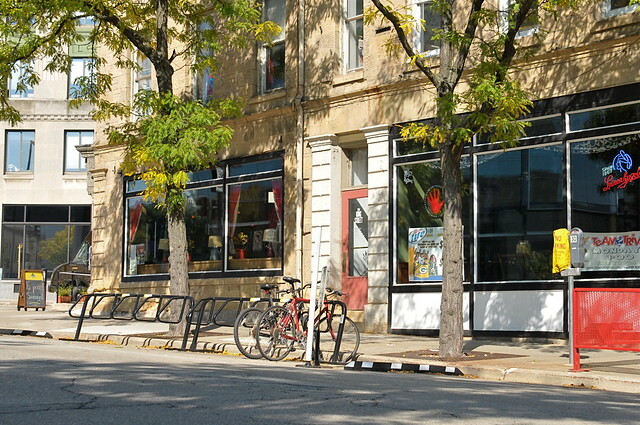 This is a pilot project to see how well accepted the concept of on-street bicycle parking is in Madison. This approach is useful in areas of the city where there is not enough space to provide bicycle parking in the terraces and other off-street locations. Businesses in the area were consulted on this project and agreed to the trial. Saris Cycling Group donated the bicycle racks to the city for this project. The racks will be removed in November to allow for winter snow plowing. So bike riders, I urge you to use these racks even if they are not the obvious choice for where you are going on a given trip. IF they get used, the city will do more of this, and if not, they will assume no interest and yank them for good. Labels: bike parking "King St"